Where did Jesus walk, who did He see, and what did He do? These aren't the exact questions in Weaver Review Questions Volume 5, but they give you an idea of what to expect when you use this resource. Unit studies don't usually come with questions and tests, but we wanted to make your homeschooling journey easier. We've developed this resource, which is part of The Weaver Curriculum® line, so that you can spend more time enjoying your family. Also, certain states and umbrella schools require each child to be tested either yearly or at the end of certain grades. With Weaver Review Questions Volume 5, your tests are already prepared using multiple choice, fill-in-the-blank, matching, essay, illustration, and other formats. Each chapter is divided into grades (1 & 2, 3 & 4, and 5 & 6), and then into subjects (Bible, social studies, science, and language arts). The back half of the binder contains the student tests. The front half of the binder contains the teacher pages with the same questions and answers in bold italics. You choose which questions your child will answer to create a tailor-made test. It's as simple as that! You'll even find instructions for figuring the percentage for assigning grades. 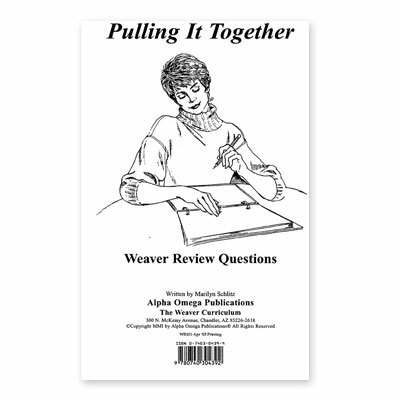 Order Weaver Review Questions Volume 5 from Alpha Omega Publications today!